When Stanford takes the field against the San Jose State Spartans in the Bill Walsh Legacy Game on Saturday, it will be doing so for the final time in the near future. Although the Bay Area rivals have played each other nearly every year dating back to the late 1940s — including eight of the last ten years — the matchup between the two teams will take a hiatus beginning next year. 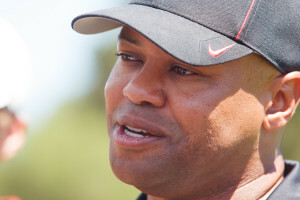 Although the overall record in the contest is lopsided, with Stanford leading the all-time series 51-14-1, head coach David Shaw admitted that he looks forward to the near-annual matchup against the Spartans, which holds a special significance to him. As a wide receiver for the Cardinal in 1993 under legendary head coach Bill Walsh, for whom the annual contest is named, a young Shaw making his second career start felt that he could exploit a weakness that he saw in the Spartan secondary. He quickly pointed the weakness out to Walsh. Walsh trusted his receiver and called the play. Seconds later, Shaw was standing in the end zone with the first touchdown of his collegiate career. As if that wasn’t enough to make the day special for the future head coach, Shaw also went on to record the game-winning touchdown on a two-minute drill at the end of the game. “Unbelievably, a hall-of-fame coach just listened to some little kid that just wanted to catch the ball,” Shaw said with a smile. While Shaw has an emotional attachment to the game, both he and his players are looking forward to getting the season started after a rare week one bye for the Cardinal. Both Shaw and senior linebacker Shayne Skov admitted that it was a strange feeling to watch college football games at the start of the season without being under the lights themselves. Meanwhile, senior defensive back Usua Amanam got some laughs out of the reporters in attendance, remarking that he had been unaware that the season had started at all until he turned the television on and saw — much to his surprise — college football being played. With the extra time off, Shaw emphasized to his players the importance of learning from the mistakes that other teams made in week one while shaking off the rust from not having played for an extended period of time. He voiced his desire for the team to be at “mid-season form” from the beginning by taking advantage of the bye week and preparing itself mentally for the challenges of the game. Shaw had also used the extra week to delay his decision in naming the dependable, departed Drew Terrell’s replacement at the punt return position. But he confirmed Tuesday that Kodi Whitfield would be returning punts for the Cardinal in 2013, leaving Stanford’s depth chart all but set going into the season opener on Saturday night. Contact Do-Hyoung Park at dpark027 “at” stanford.edu.